The good news is that Issue 20 of my favourite Gerry Anderson fanzine, Andersonic, has just been released, so it’s time for my usual plug. So, what’s on the menu this issue? Brian Johnson interview – a new interview with Space 1999’s FX director. Brian also talks about his work on Stingray, Thunderbirds, 2001 and Alien/Aliens amongst other things. 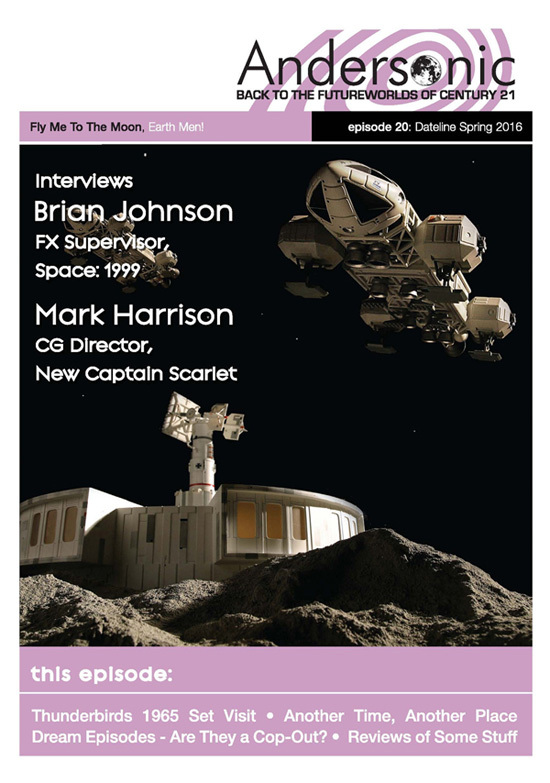 Mark Harrison interview – CG director on New Captain Scarlet and leader of the Scarlet Team, Mark discusses his work on Gerry’s last series. Thunderbirds 1965 – We take a trip to Slough and visit the set during the filming of ‘The Abominable Snowman’, the first of the three episodes being made there. Anderson Dream Episodes – Are they clever lateral thinking or a feeble cop-out? Space: 1999/ Another Time, Another Place – Mark Braxton reviews one of the first series’ weirder episodes. Reviews – We review Alan Shubrook’s new book, the CD21 interview CDs and ‘The Lost Worlds of Gerry Anderson’ DVD. Strip Story – the Andersonic time machine goes back to 1965 to dissect the first issue of TV Century 21. Thunderbirds Are Go – our ‘episode guide’ for the first 13 instalments of this new series. … plus a few other things we’ve managed to shoehorn in. The issue also has new art by Richard Smith. Issue 20 of Andersonic is 44 pages, black & white interiors, and colour front and back covers, both inside and out. There’s lots of lovely photos and artwork to go with the great articles and reviews, and all of this costs a measly £2.75, including p&p within the UK. Check out the website at www.andersonic.co.uk for details on how to purchase the current issue and back issues, most of which are still in print. Andersonic is, by far, my favourite Gerry Anderson fanzine. It’s a genuine, classic, traditional, “real” paper/print high quality A5 zine, which is a huge plus in my book. There are very few traditional print zines around these days (almost everyone has gone digital) compared to their classic heyday back in the 1970s-1990s. They’re a bit of an endangered species, in fact. So a good one like Andersonic is something truly special. Add to that the sheer quality of this zine, consistently, issue after issue, and I can only applaud Richard Farrell and his talented team for producing this great zine . The zine has been going for ten years now, which is roughly a six-monthly publishing schedule, although that has slowed down in recent years to an almost annual schedule, alternating roughly every six months with its equally high-quality sister Doctor Who publication, Plaything of Sutekh. We still get a zine every six months or so, but it’s two different zines rather than just the one. It takes a lot of time and effort to put quality zines like this together. I’d rather have a lengthy wait between issues and get a zine of higher quality, than a more frequent release at a lower quality, or, worse still, Richard giving up altogether because of a far too punishing zine release schedule. I cannot recommend this fanzine highly enough. It deserves as much support as it can get. Buy it. Now. Yet another classic telefantasy series has it’s birthday today (September sees a lot of that kinda thing). Thunderbirds has hit the big Five-Oh. It’s 50 years since old favourite kid’s (and big kid’s) series Thunderbirds premiered on British television, way back on 30 September 1965. The pilot episode, “Trapped in the Sky”, was first broadcast on the ITV network’s regional channels ATV Midlands, Westward and Channel Television. Other ITV regions, such as ATV London and Granada, didn’t start transmissions until the following month. Thunderbirds was the fourth Supermarionation puppet show, following in the footsteps of Supercar, Fireball XL5 and Stingray, and it ran for two seasons and a total of 32 episodes. Maybe it wasn’t my absolute favourite Anderson puppet series (that was Captain Scarlet), but Thunderbirds has always remained the most popular of the Gerry Anderson series. The best recent news on the fanzine front is that Richard Farrell and the gang have just released Andersonic #18 onto “the streets”, and just in time too, as I was in dire need of something good to read. For those unfortunates who aren’t “in the know”, Andersonic is THE best (as well as my own absolute favourite) Gerry Anderson-based fanzine, covering all the various Gerry Anderson shows, both the various live series and the classic puppet shows, as well as the excellent CGI animated New Captain Scarlet series. Oh yeah, and did I mention that Andersonic is a real, honest-to-goodness A5 printed zine, not an electronic publication. Real “paper” zines are as rare as hen’s teeth these days, so this is a big, big plus, as far as I’m concerned, as I’ve always loved real zines, the ones you can actually hold in your hand and turn the pages. I LOVE real, paper fanzines. David Elliott interview – a new interview with APF’s editor and director in which he discusses his work on the APF series. 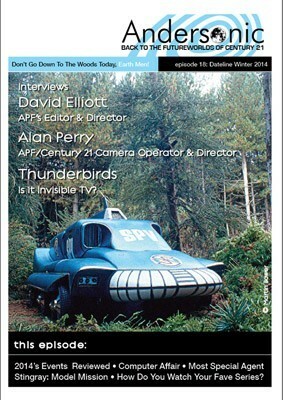 Alan Perry interview – Alan talks of his time working at APF/Century 21 on series such as Stingray and Thunderbirds and directing Captain Scarlet and the live-action UFO, working with puppets, actors and chihuahuas. Thunderbirds – Is it Invisible TV? A look at why the Andersons’ series are often overlooked by the more academic articles about television. Joe 90/ Most Special Agent – two writers discuss this series opener. One of them likes it… the other one’s not so sure. How do you watch your fave series? – Our writers reveal their little rituals when watching a bit of Anderson telly. Strip Story – we look at an individual comic strip to see what makes it tick. This issue – Countdown’s Stingray story ‘Model Mission’ drawn by Brian Lewis. …plus Alpha Log reports, 2014’s event reviews and The Overseers of Psychon. New art by Nigel Parkinson and cover image by Martin Bower. My copy of Andersonic #18 arrived several days ago, and just as soon as I can get one of those rare quiet evenings to myself, I have lots and lots of great reading to look forward to. At only £2.70 (British Pounds Sterling), inclusive of postage (within the UK – check the website for postage elsewhere), for 44 pages of wholesome Anderson goodness, you can’t even buy a pint of beer down the pub for that. All fans of Gerry Anderson AND of fanzines should get their booties posthaste over to the Andersonic website and order themselves a copy of this delicious little zine. I’m a big fan of sci-fi on television, which I almost always refer to by its “proper” name, telefantasy. The 1950s-1990s were, in my opinion, the Golden Age of telefantasy, and the first real telefantasy started about a decade or so before my birth (in December 1960), when Captain Video and His Video Rangers first appeared on US television in 1949, followed closely in the early 1950s by the likes of Space Patrol, Tom Corbett: Space Cadet and Rocky Jones: Space Ranger. UK telefantasy was slightly slower to get off the mark, and it was mostly with one-offs like the 1949 adaptation of H. G. Wells’s The Time Machine and the prestigious 1954 adaptation of George Orwell’s 1984. The first ongoing, serialized sci-fi productions of any note were the three Quatermass serials which aired in 1953, 1955 and 1958. These were the first real stars of pre-Doctor Who UK telefantasy, and, in my opinion, the classic 1958 six-part serial Quatermass and the Pit remains, to this day, one of the greatest examples of telefantasy ever produced. But those were all produced and televised well before I was born, and it’s only really been in more recent years that I’ve discovered and begun looking back at some of the much older telefantasy series, which aired in the years between the first appearance of Captain Video and His Video Rangers in 1949 and the very first episode of Doctor Who, in November 1963. It would be the mid-1960s before I started to show the first glimmers of interest in any kind of sci-fi on contemporary television. I’ve been an avid viewer of sci-fi television of all kinds ever since the time that Doctor Who first began to register in my very young and impressionable mind around 1966-1967. But it was when Jon Pertwee first fell out of the Tardis at the beginning of Spearhead from Space, in January 1970, that marked the moment where I can definitely say that I made the leap from merely enjoying Doctor Who, to becoming an obsessive, life-long fan. I also became a huge fan of the original Star Trek, which first appeared on UK television channel BBC1 in July 1969, and also the new live-action Gerry Anderson series UFO, which first aired on ITV in 1970. I’d previously watched, and enjoyed, the various Anderson puppet shows such as Captain Scarlet, Thunderbirds and Stingray, but I preferred the live shows, and UFO was where I first became a real Anderson fan. By December 1970 (when I’d reached my tenth birthday), with Pertwee almost a year into his tenure on Doctor Who, Star Trek at the height of its popularity on BBC1, and UFO featuring prominently on ITV, I was now old enough to really start understanding and appreciating television sci-fi in general. These were the first three telefantasy series that I really got into, and it’s no big surprise that these series have always remained right at the very top of my list of favourites. As I moved into the 1970s, things really started to heat up. I began to get heavily into other UK telefantasy series such as Timeslip, The Tomorrow People, Space: 1999, Blake’s 7 and Sapphire and Steel. I was also hooked on then-current 1970s US telefantasy such as the animated Star Trek, The Six Million Dollar Man, The Bionic Woman, Kolchak: The Night Stalker, Wonder Woman, The Incredible Hulk, Buck Rogers and Battlestar Galactica. And, of course, UK television was also awash with re-runs of the various Irwin Allen series, Voyage to the Bottom of the Sea, Land of the Giants, The Time Tunnel and Lost in Space, plus re-runs of other classic US “cult” TV sci-fi series such as The Invaders, The Twilight Zone and The Outer Limits. Take all these great telefantasy series, and the fact that the early 1970s marked the time that I was moving into my teens, and it was a great time for a young fan of sci-fi television like myself.